Handshake Interactive Quotes allow you to send a personalized quote to a buyer that they can review and confirm on the web with one click. 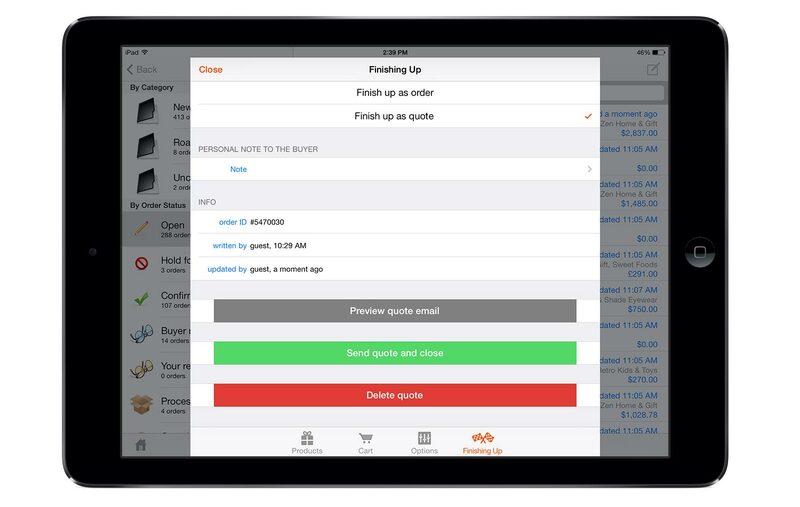 To use the Interactive Quotes feature, create a new order, select a set of products and choose the “Finish up as quote” option once you’re done. Your buyer receives an email with a link to an online version of the quote you just created for them. Interactive Quotes are great for scenarios where you aren’t able meet in person but still want to make the sale, or if you leave a meeting without closing but want a reason to follow up. Some Handshakers also use this feature at tradeshows in case a buyer needs back-office approval or potential modification before they are able to confirm an order.